“Oh, you’re so good with her! I bet you’d love a dog of your own,” said the woman sitting on the bleachers. “Yeah, he’s really scared,” Charlie chimed in with a rueful smile. It’s no secret that Jack’s been terrified of dogs since he was about two years old. I devoted an entire chapter of the book to the dog problem, and I know you all had a good, long laugh at me when you read the part where I screamed at an elderly blind man to get his service dog out of the way. But that’s okay. I forgive you. I’m really kind and generous that way. There have been small breakthroughs, of course. One time he pet a dog in the hotel lobby of a Hampton Inn, surprising us all. Last summer he reached out a finger and stroked my friend Pam’s new puppy. But for the most part, he’s still afraid. This is stressful, the dog thing. It means if we’re going to someone’s house for dinner, I have to call and diplomatically ask what the plans are for the family pet so I can prepare Jack. My sister-in-law hosted Thanksgiving last year, and it was quite a show, let me tell you. She has two dogs, and Jack started whimpering before we even parked the car. In between bites of turkey and mashed potatoes, Joe and I spent the entire meal telling him to calm down and stop screaming, trying to get him to finish his dinner before fleeing to the basement because the dogs didn’t go down there. But still, from time to time we talked about getting a dog of our own. About three years ago I became mildly obsessed with the idea of owning Great Danes. Plural. I wanted two of these gentle giants, and I tossed names like Kibbles and Bits, Duke and Daisy, Harry Potter and Hermione. My first thought was, “What did you put in that coffee? Cows don’t run!” But sure enough, I looked out and saw a black and white streak in the morning light. We all ran to the windows and the streaks stilled for a moment: Great Danes. Plural. They had gotten loose from a family about three miles down the road and somehow made their way to our house. I was convinced it was a sign. But while my sign pointed to looking online for breeders of Great Dane puppies, Joe’s sign had big, bold neon letters that said NO WAY. Our combined objections to getting a dog are pretty typical. Shedding. A yard full of dog poop. The responsibility to race back to the house to let a dog out, just when we’re finally at the point where we have some freedom from diapers and nursing and toddlers and babies. After ten years, we’re finally starting to travel a little. Oh yeah, and our son is terrified of them. But oddly, the first on the list of reasons why we shouldn’t get a dog also topped the list of why we should get a dog. Part of me was convinced that we needed to introduce a dog into Jack’s life so he’d become less anxious about them. Unable to come to a decision, we shelved the idea for a while. But Joey and Charlie’s comments last fall reopened the discussion, for me at least. I decided it was time. You see, we’ve always been diligent about making sure Jack does not control our family. It would be easy to let him be bossy and make us eat TV dinners and watch the Wizard of Oz each night. But we don’t. He eats what we eat and watches what we watch and goes where we go. Oh sure, our kids will need therapy one day, and they’ll sit on the counselor’s couch and complain how their mean old mother took away the Wii and their parents had loud arguments in front of them. But they’ll never be able to complain that their brother with special needs held them back. But hearing Joey and Charlie, I realized he was holding us back. Or, more accurately, the wily snake of anxiety that persists in Jack’s mind and soul was holding us back and calling the shots on a family pet. (Note: Joe was still not completely on board. Oh, he said he’d be happy to get a dog and pay for an electric fence and listen to the barking and all of that, but he wasn’t doing one thing for a pet. Not lifting one finger. He was not coming home from work and putting on anyone’s leash or filling a water bowl or using a pooper-scooper in the yard. His life, he told me, is busy and demanding enough without picking ticks out of fur and giving heartworm medicine and checking for fleas, thankyouverymuch. 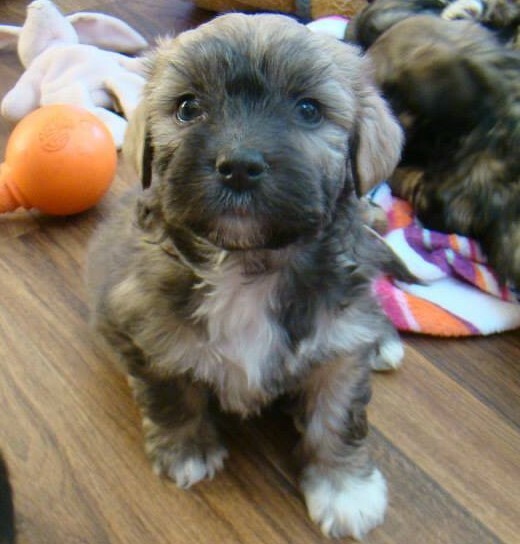 After a lot of deliberation, we chose a breed known as a Teddy Bear Dog; half-Shih Tzu, half Bichon Frise. Hypoallergenic. No shedding. The polar opposite from the Great Danes I once imagined getting, this type of dog only weights 10-15 pounds fully grown; a manageable size for me, and I hoped, Jack. In February, I chose one from a breeder in Maine and put down the deposit and waited. The puppy would be ready to come home in late April, so Joe and I decided to surprise the kids on Easter morning. During the three months we waited, I thought a lot about Jack’s reaction to a puppy, and what I hoped for by bringing one into our family. I hoped the other kids would be thrilled. I hoped he didn’t keep me up all night. I hoped there weren’t a lot of pee accidents on my new carpet. But ultimately, I hoped Jack could decide for himself how he feels about the puppy, instead of anxiety’s wily snake hissing into his ear. I hoped that maybe the best way to tame the serpent is to draw it out into daylight, look straight into its flinty eyes, and hiss right back; I am the mother and this is my son and you do not decide. You do not decide for me, for Jack, or for our family. Right about now you’re probably wondering how it went Sunday morning. You might be curious if Jack packed up his khaki pants and striped shirts and headed out the door, regretting the day he was born into this family, or if introducing a puppy to my son who has autism and is phobic of dogs was a smashing success. Through the din of four children laughing and jumping and shouting things like, “I can’t believe we have a puppy! Look a puppy!” one robotic voice was unmistakable. Joe and I exchanged glances and I looked back at Jack, standing apart from the other kids with his hands clenched to his sides. And I thought to myself, what have I done? I don’t know why I thought I could conquer this merciless snake so easily. But later that morning, after the Easter crepes were eaten and we sent the kids upstairs to get dressed for church, Joe stood at the kitchen sink washing the frying pan. He looked over at the puppy’s small crate and saw Jack kneeling before it. Quietly, Joe crept over and heard a soft whisper. When Joe came upstairs to tell me this, I thought about how life with autism is so very complicated. And as I continue down the rocky path of spectrum disorder alongside my son, I am learning that it is a tender balance of social stories and meltdowns, of risk and reward. Rarely is there smashing success, but some days there are soft whispers of progress. How this time, I just need to take a leap of faith in him, in me, and in a small puppy named Wolfie. The first thing out of Jack’s mouth this morning was, “I have a dog.” I was shocked. Good for you guys!! ?